Kirynic is a duplicitous world of high-magic and cloak-and-dagger skullduggery. It’s a campaign setting intended to be compatible with 5e Dungeons and Dragons. Below are the version 0.1 documents. These have not been play-tested and should be considered very rough drafts. I would love any feedback. These documents contains basic backstory and variant rules for this D&D setting. 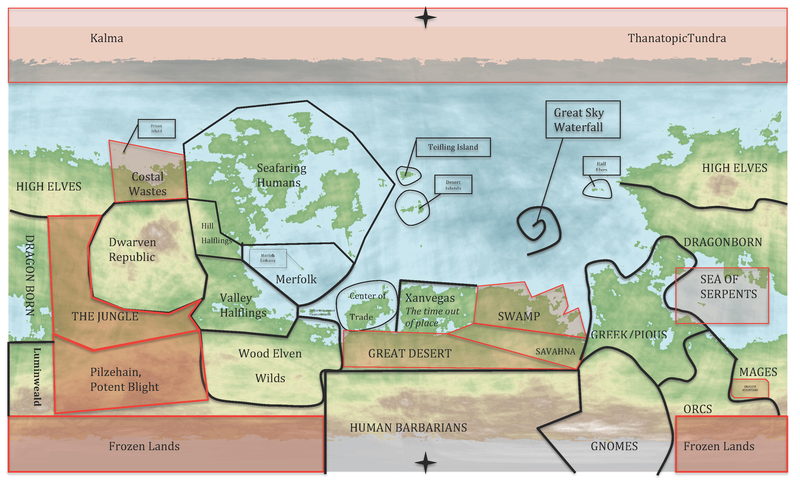 A rough map of the world of Kirynic. Because of the dual nature of Kirynic, every location is intended to provide the backdrop for two entirely different kinds of adventure. Full player’s companion coming soon. The map was randomly generated at DonJon Fractal World Generator. Eventually, I plan on refining it based on the randomly generated map, but that’s a log way down the road. Special thanks to Goblin Punch, the article on the Great Rot was a big inspiration for the Pilzehain which spun out into this whole setting. Acknowledgements to r/DnDBehindtheScreen and especially /u/FamousHippopotamus. His writings on DMing and World Creation really helped me go for it. Of course, lots of thanks to /r/DnD and /r/DnDNext. Thank you to @MrShawnGraham for being a great DM (and friend). @Alohn, @KelseyKelsem and @KellenOnWheels for being the best party ever. Inspiration sources include Stephen King’s Dark Tower Series, Keith Baker’s Eberron Setting, Star Trek Voyager & Deep Space 9, Joss Whedon’s Firefly and Buffy, Neal Stephenson’s Snow Crash, William Gibson’s Neuromancer, Charles Stross’ Accelerando, Chuck Palahniuk (His whole library). Neil Gaiman’s American Gods. Dean Koontz’s False Memory and Lightning. I’ll ad more further reading as I think of it.